Café Manna is one of the first 100% vegetarian restaurants in Southeastern Wisconsin. We are committed to bringing you fresh, “made from scratch” delicious food. We have produce delivered daily to ensure our dishes are fresh and full-flavored. Many of our ingredients are locally grown and chosen for seasonality. Additionally, we use a reverse osmosis water purification system. Café Manna supports the environment by using eco-friendly building materials. The floors and front counters are made of bamboo. Window and bathroom counters are “paper stone,” constructed of recycled paper. Recycled metal light fixtures, walls covered with 100% non-toxic paint and foyer partitions fashioned of recycled plastic complete the Café’s decor. We further support the environment by using carry-out containers made from sugar cane, corn, potato or vegetable protein. We use no plastic or styrofoam. We are proud to be the first Certified Green Restaurant® in Wisconsin. 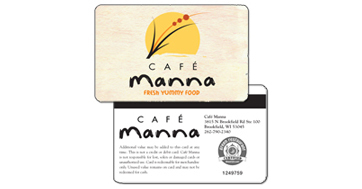 Café Manna is one of the first restaurants in the United States to reach the 3-Star Certification level.